East & West Analytical Instruments,Inc. Daihan Labtech India Pvt. Ltd.
Raypa - R. Espinar, S.L. 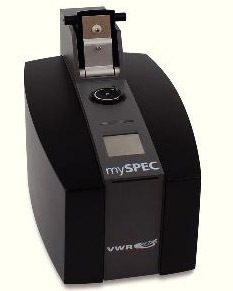 The versatile mySPEC range of spectrophotometers allows the user to perform measurements on nucleic acids and proteins contained in a very small sample volume. The 'mySPEC Twin' models have an additional port for a cuvette so that cell density or enzymatic activity measurements can be performed. Preconfigured modules allow for rapid, fully automated data analysis for a wide variety of applications including, concentration and purity of RNA and DNA; protein measurements (A280, Bradford, Lowry, BCA, Pierce 660); determination of labelling efficiencies; colorimetric assays on enzymatic activities and cell density measurements. SV Instruments Analytica Pvt. Ltd.
© 2016 Svianalytica.com. All Rights Reserved.